This tour was a good way to get a feel for the Costa Brava if you don't have a car. 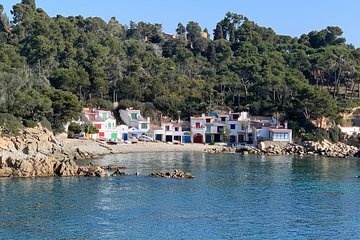 We visited Palamos and could walk part of the beautiful Cami de Ronda. We had a quick lunch in Calella de Palafrugell (although I would have liked more time here to explore this little beach town). Our last stop was at Pals. Our driver was good and let us customize how we wanted to spend our time. We didn't really need him to explain a lot of things since we preferred to be on our own. The only thing I would change would be to have the pick up point be at our hotel, or somewhere more central to Barri Gothic. Getting to the pick up point required taking the metro and walking a ways, and was a huge hassle since it was kind of out of the way. Overall though, I'm glad we did the tour since it was basically like having a private driver all day. We had a great experience on this tour! Our guide Joan was very courteous and helpful. We appreciated his laid back style as he led us around the Costa Brava hiking trail. The sights were absolutely gorgeous. We even had the chance to swim in the crystal-clear Mediterranean water at the spot of our choosing. Afterwards, we had a delicious lunch in the Medieval village of Pals. We would definitely recommend to anyone up for an adventure!